Contains 450 mg of USP Progesterone per ounce. That is 20 mg per 1/4 teaspoon. Just massage a dime-size dollop of cream into your skin twice daily. Try your wrists, arms, thighs, tummy - whatever you like. 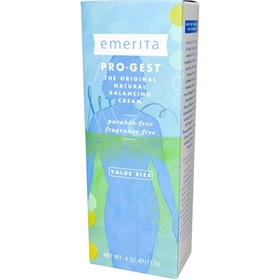 Progesterone cream protects your bones, and relieves menopausal symptoms such as hot flashes, mood swings, night sweats, weight gain and sleeplessness. This product contains progesterone, a chemical known to the state of California to cause cancer. As with any product, if you experience irritation or discomfort, discontinue use and consult a licensed health care practitioner. The bottle inside is sealed for your protection. What's not in it: No parabens, mineral oil, petroleum or animal anything. Our products are never tested on animals.